The footage is amazing because some of it has never before been seen by the public. The magnificent engines of the Saturn V rocket fired with latent, unleashed power necessary to propel the men into space. Rows and rows of white-shirted men monitored their analog screens with manuals perched on the tables in front of them. Thousands of people came to Cape Canaveral to see the lift off, camping out in their cars and tents or simply sleeping in a sleeping bag on the beach. There was the occasional glimpse of celebrities, people like Johnny Carson and Lyndon Johnson, who wanted to be a part of it too. There are periodic mentions of the heart rates of the astronauts. During the launch, Armstrong’s rate was reported at 110, Collin’s around 95 and Aldrin’s, shockingly low, near 88. The moments as the lunar module descended foot by foot to the moon are captured, and the tautness of the unknown is palpable. The director’s dual screen uniquely captured the camera footage, on both the lunar module and the command module, as they slowly, carefully docked in their tense rendezvous after the moon landing. 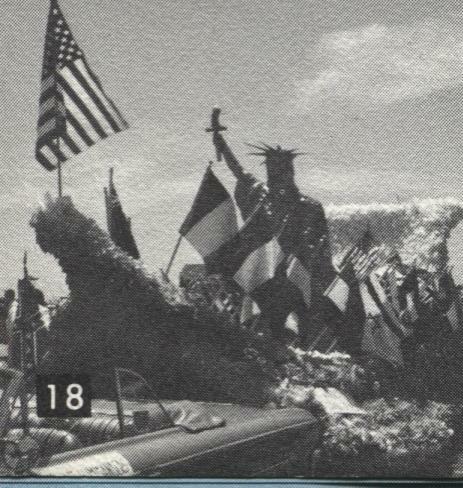 The welcome home parade, set against the backdrop of beautiful, sunny Chicago, is featured prominently, with wildly cheering people and Secret Service agents running alongside the astronauts’ convertibles. The colors are sometimes startling. The bright summer clothes worn by the people on the beaches. The oranges and reds of the rocket as it fired. The bright, kapton foil on the lunar module, in contrast to the dull color of the moon. The heat shield of the command module as it moved through the earth’s atmosphere. 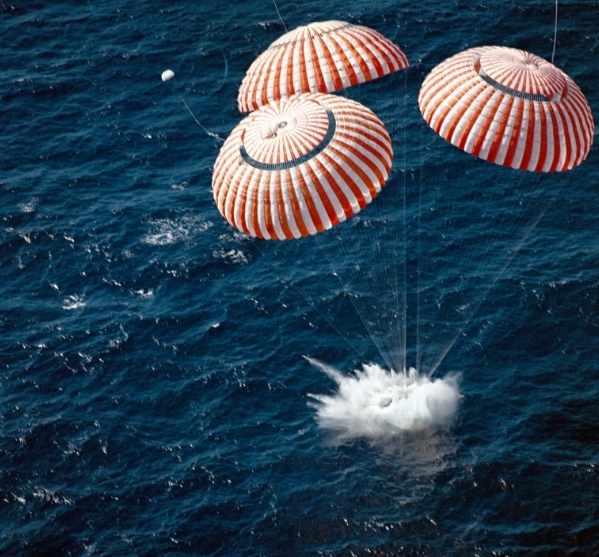 The beautiful parachutes lowering the space capsule into the ocean. And, of course, the swirling whites, greens and blues of planet earth as seen from space. The sheer science of it all is breathtaking. And the geometry. Wow, the geometry. The math that was required to get the three astronauts to the moon and back is especially noteworthy, give the small margin for error–and the fact that all of it was done without calculators. And, lastly, there is the utter calm and professionalism of the three astronauts, Neil Armstrong, Edwin “Buzz” Aldrin and Michael Collins as they go about their duties, interjecting occasional humor when time allowed. Apollo 11, the newly released documentary directed by Todd Douglas Miller, tracks the mission to the moon in 1969. The world watched in suspense as the rocket finally took off and began the many maneuvers required to get the astronauts to the moon and back. 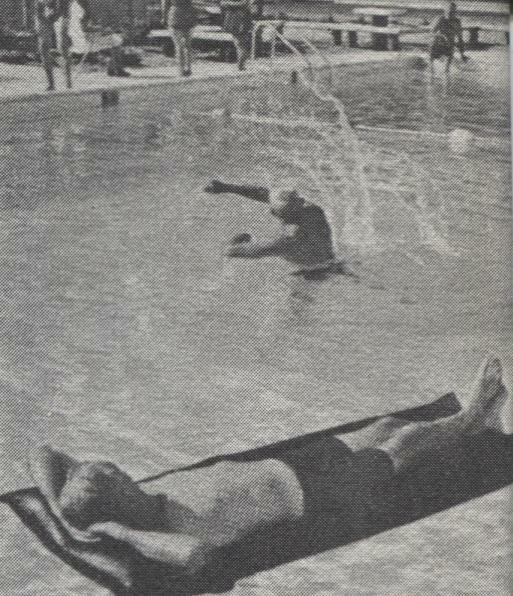 During the eight day voyage that began on July 16 we, on earth, ate, slept, went to work, and enjoyed our summer. But we were attuned. To both the tenseness of the situation and to our radios and televisions that tracked the steady progress of the journey. When it was over, and the astronauts were back on planet earth, there was relief, there was sheer joy and there was overwhelming pride. 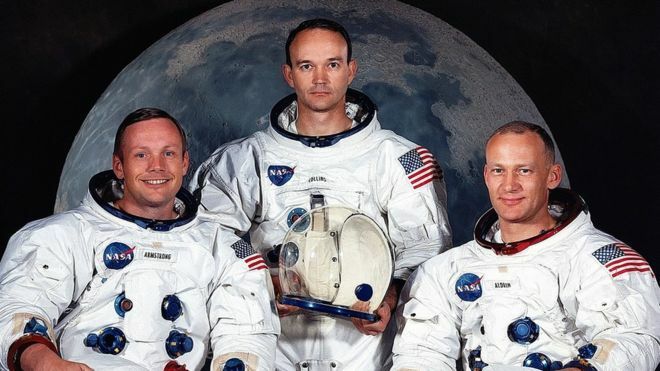 The three astronauts had most assuredly reserved their place in history as the heroes we revere today. The people of Schaumburg Township, though, paid their respects in a way that is evident nowhere else in the country. 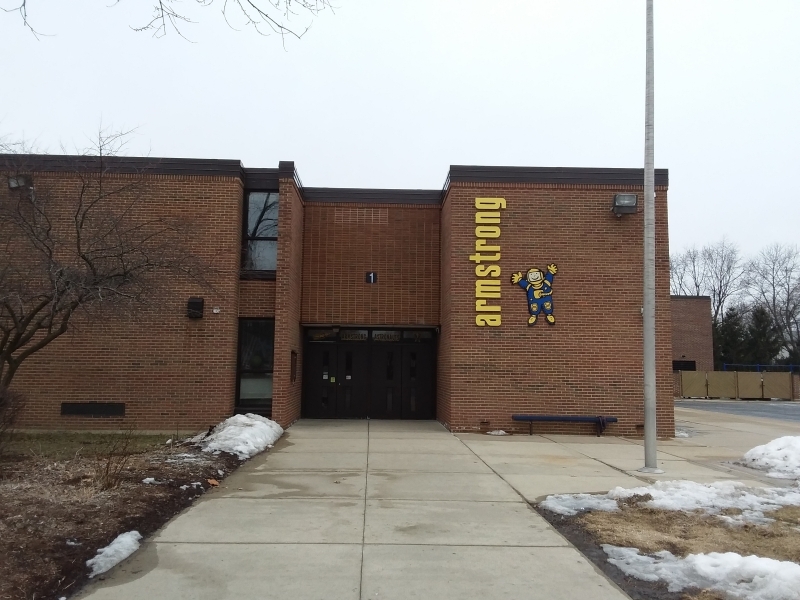 In 1971, as a result of the area’s furious growth, Schaumburg Community Consolidated School District 54 opened four elementary schools, naming three of them in honor of Armstrong, Aldrin and Collins. 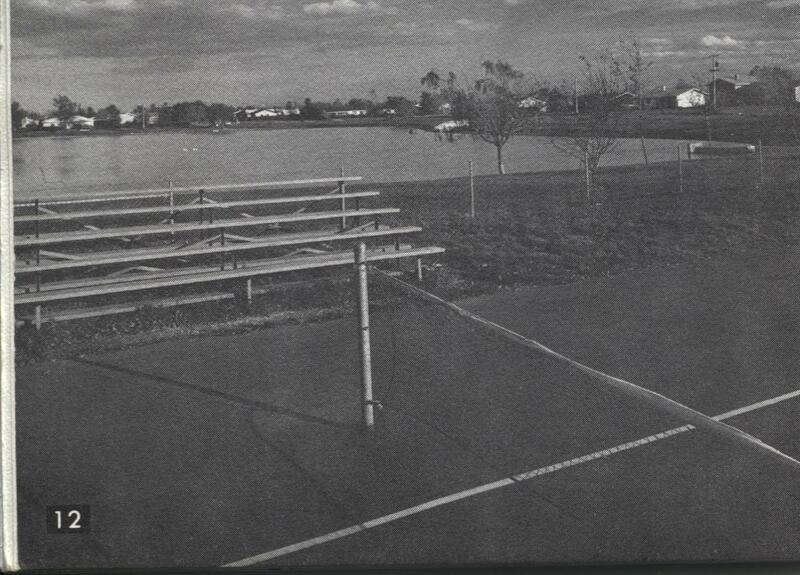 All four schools built that year–including Dirksen–are identical, as you can tell in the photos below. 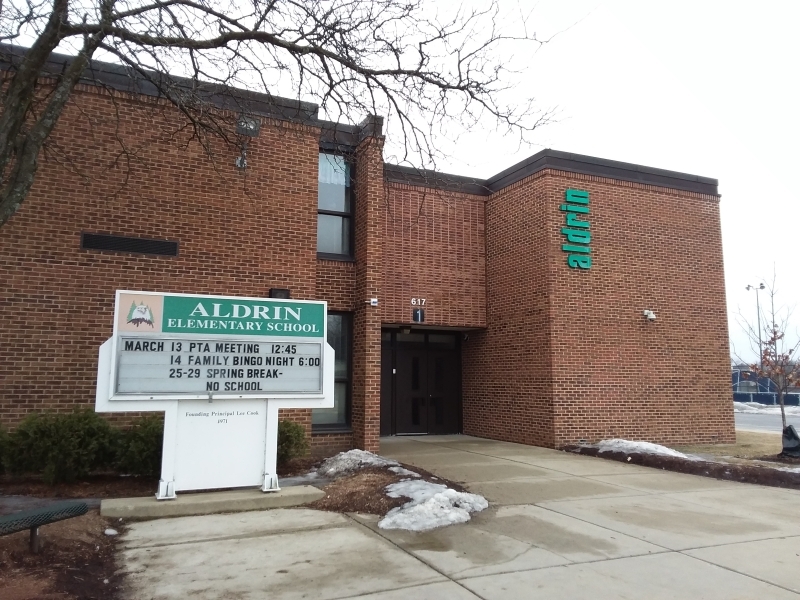 If you look closely enough at the sign for Aldrin School, you can see that the mascot is the eagle. This is a direct reference to the Lunar Module that landed on the moon and was named the “Eagle.” It was–uncoincidentally–piloted by Buzz Aldrin. On Armstrong School is their mascot of an astronaut, which requires little explanation! 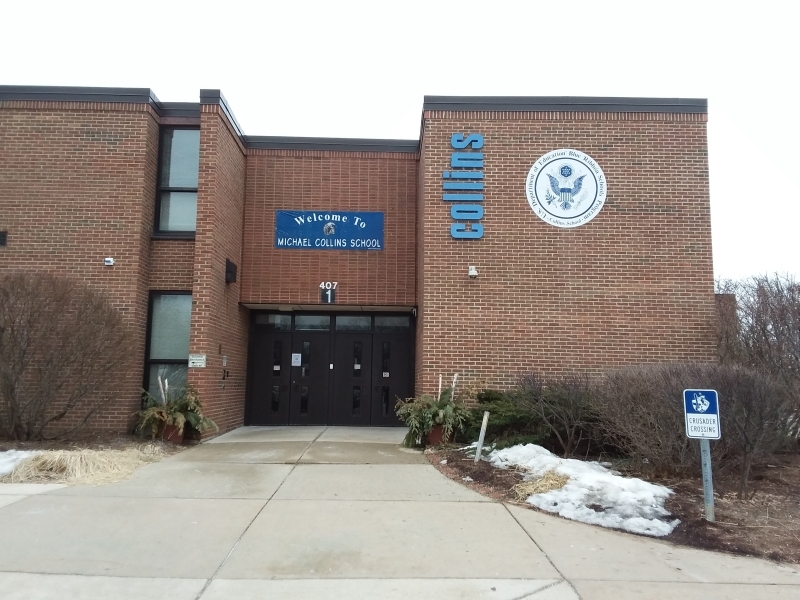 Below is Collins School, named for the command module pilot who orbited the moon while Armstrong and Aldrin took those giant leaps for mankind. Scattered throughout the district, these schools are a steady, gentle reminder of a stunning voyage that happened 50 years ago this summer. The astronauts gave the best parts of themselves on that trip. Two years later, Schaumburg Township returned the favor and thanked them in the best way they knew how. A new Lions Club was begun in Hoffman Estates and Thomas Sandow of Roselle was elected president. 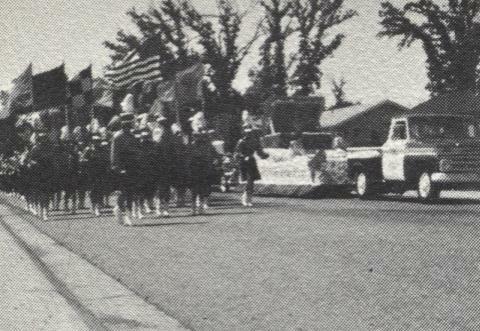 They had 16 members and was organized through the efforts of the Arlington Heights and Palatine clubs. 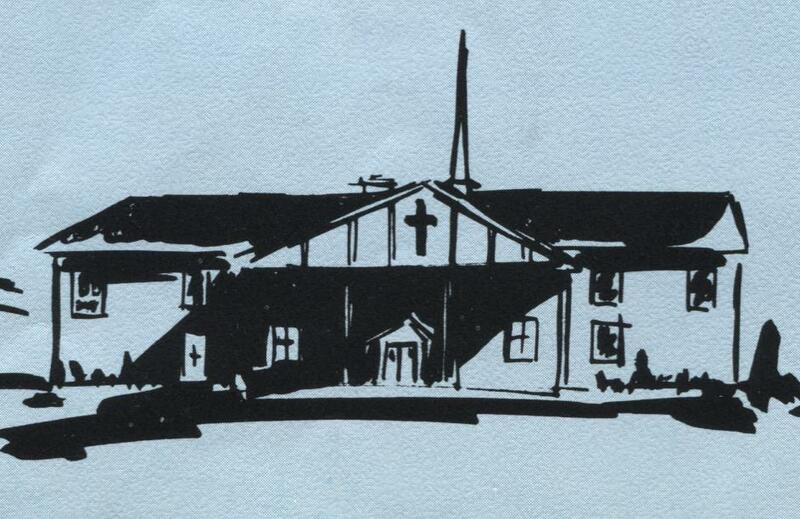 Our Saviour Methodist Church prepared to celebrate their first anniversary in Hoffman Estates after having been organized March 16, 1958. During the first year the church purchased five acres from the Meineke’s Honey Farm on the southwest corner of Plum Grove and Golf Roads. In the meantime, they were holding services at Blackhawk School. It was announced that F&S Construction would open four new model homes in their Parcel C development. A split level, three-bedroom Lincoln model lead the lineup. The Village of Hoffman Estates made plans to erect an armed forces honor roll board on village property to honor those who died in Vietnam. The village had its first casualty when Alan Ramsey, son of Mr. and Mrs. Robert Ramsey, was killed in combat on February 2. 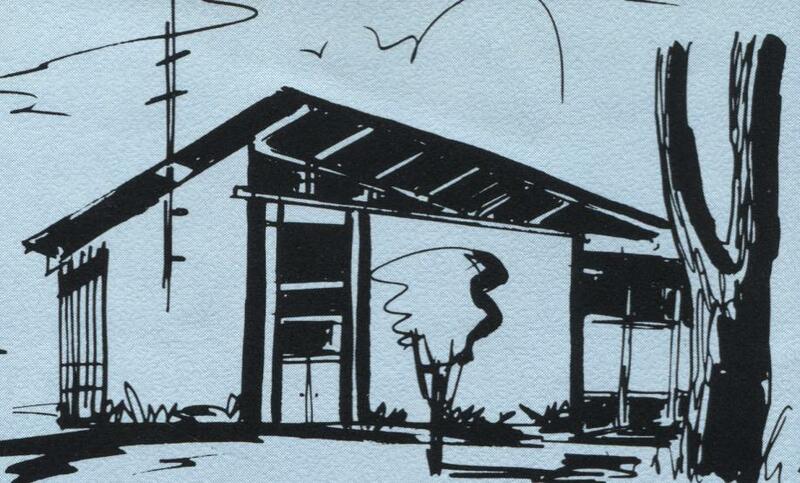 Kennedy Brothers and 27 young men from Hoffman Estates High School planned to team up to build a three-bedroom ranch house in the Colony Point subdivision. The plan was for them to work five days a week from 10-12 and 1-3. They were part of the building trades program at the school. The Village Board gave approval for the Mobil gas station at Golf and Higgins Road to become a self-service station. They were also given approval to sell convenience food. The Camp Fire Leaders of Hoffman Estates were scheduled to meet at Lincoln Federal Savings & Loan on Higgins Road on Tuesday, March 20 at 9:30 a.m. The village board voted to ban video arcades and their coin-operated machines. A limited number of machines were to be allowed in bowling alleys, movie theaters, restaurants and convenience stores. The Miss Hoffman Estates pageant was looking for young women interested in participating in the pageant that would be held on April 16 at 3:00 p.m. at Eisenhower Junior High School. The winner would go on to represent the village in the Miss Illinois pageant and, possibly, the Miss America pageant. The pageant chairwoman was Debbie Schoop. 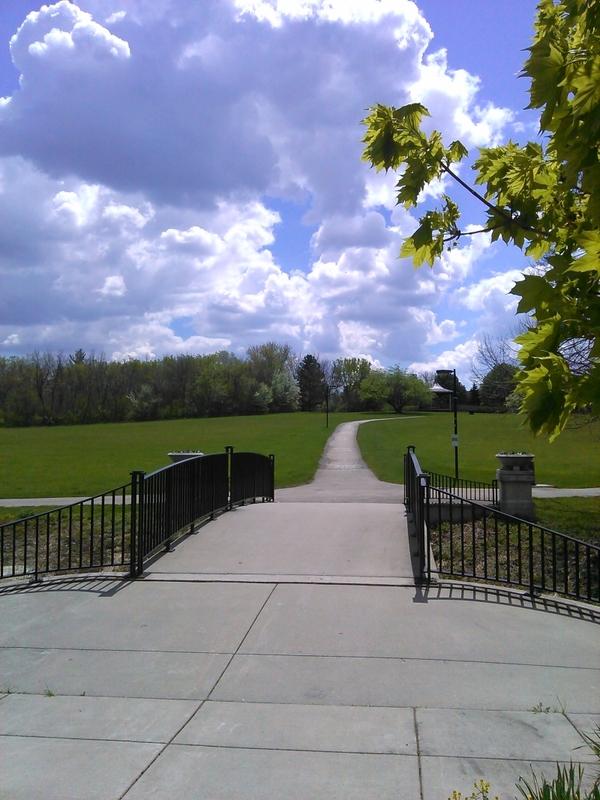 The Hoffman Estates Park District was interested in installing a 6-foot high chain link fence around two holes of the Poplar Creek Golf Course to prevent trespassers from cutting through. The Village of Hoffman Estates moved closer to approving an ordinance that would ban the use of laser pointers by minors under the age of 18 except at home. ComEd reported that they did a major tree trimming project in the Highlands area and repaired a number of wires that had been spliced too many times, straightened and replaced some faulty poles and added fuses to several feeder lines in the Highlands. All of these actions were intended to reduce the number of power outages in the area–particularly during major storms. Garibaldi’s was advertising the special of a 16″ cheese pizza “all day, every day” for $8.95. 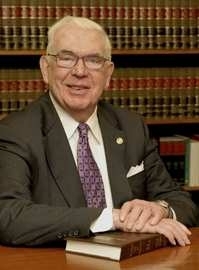 John Porter Kelley who served as the attorney for the village of Hoffman Estates from 1963 to 1970 passed away on March 22. He also helped found St. Hubert Church in 1960. 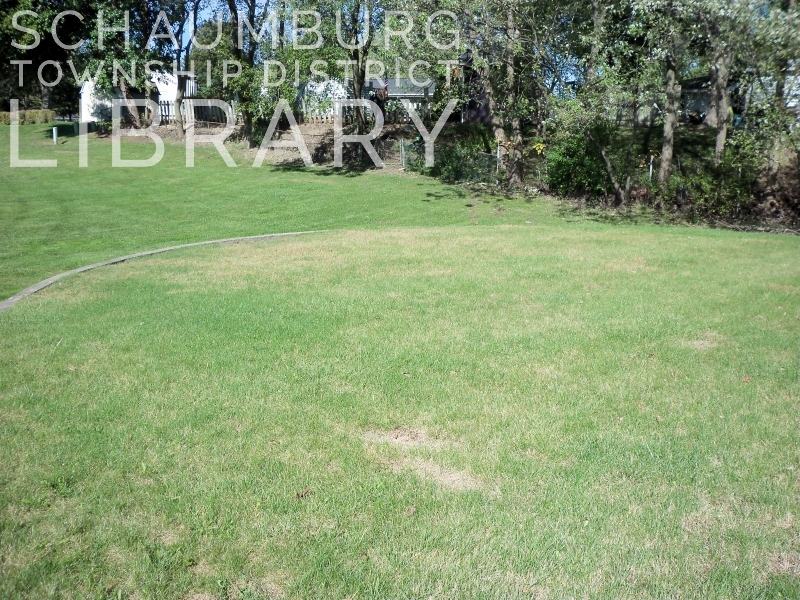 The Canterbury Fields Park project was scheduled to have its first phase completed by August. The Park District board voted to change the site plan and added a cricket field instead of a softball field due to residential interest. 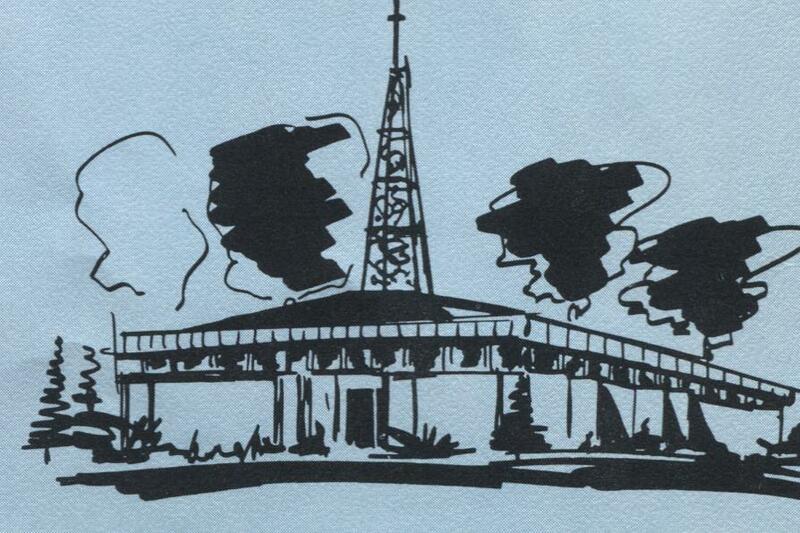 In Community From Cornfields, the little booklet that keeps on giving, there were two pages devoted to the churches of Hoffman Estates. 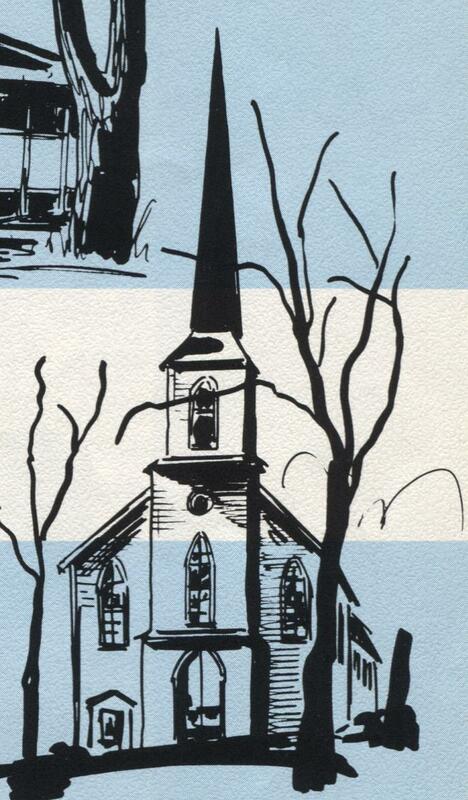 Rather than photos, drawings were inserted of all of the church buildings in existence at the time. Two other churches had been formed but did not yet have buildings. They were Community Covenant Church, which was meeting in Blackhawk School at the intersection of Illinois Boulevard and Schaumburg Road, and Highlands Baptist Church whose location was 223 Northview Lane. Their congregation met in Hillcrest School. The drawings of the church buildings are below. As a small local history quiz, please let me know in the comments below or in an email what the name of the churches are. As correct answers are sent in, I will switch out the number with the name of the church. Thank you for playing Hoffman Estates Church Trivia! Another vote for incorporation was held on Saturday, February 21 from 6 A.M. to 6 P.M. at 117 Cumberland Street which is in Parcel B, just off of Roselle Road. The pro-incorporation group held a party at the Buggy Whip (Easy Street Pub) the night of the vote. The proposal, however, was defeated by a vote of 276-142. Another vote was scheduled for September. A Hoffman Estates unit of the League of Women Voters was formed as a branch of the Palatine chapter. Women who helped organize the unit were Cleis Jensen, Sally Probst and Louise Dennett. A Valentine Square Dance was held at Our Saviour’s Methodist church on Saturday, February 14 starting at 8:30. Refreshments were served and donations of $1 per couple were requested to attend. 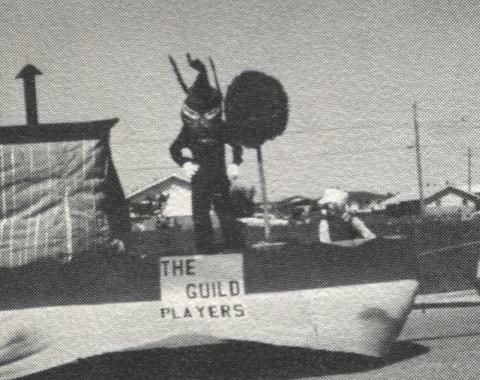 The Dance committee was headed up by Gloria Bowen on Geronimo Street. 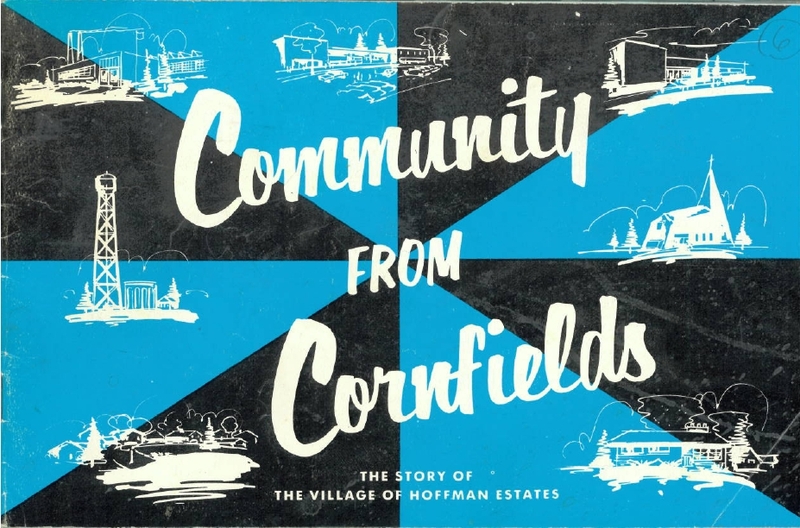 A new publication called “Community From Cornfields,” celebrating Hoffman’s 10th anniversary, was all the rage. 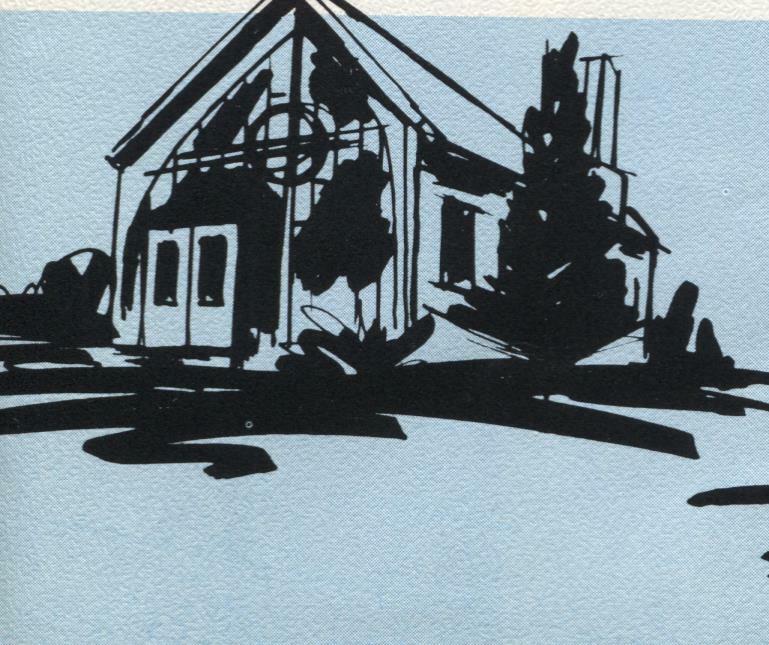 Hank Linton, a commercial artist on Edgemont Lane, contributed a two-page drawing of local churches and designed the brochure’s layout. The first four-bedroom ranch model houses in Hoffman Estates were offered in the new High Point subdivision by Hoffman Rosner. Mobile classrooms at Hillcrest School in Hoffman Estates and Collins and Dirksen School in Schaumburg were scheduled to close at the end of the school year due to declining enrollment. Room was, once again, available in the school buildings. 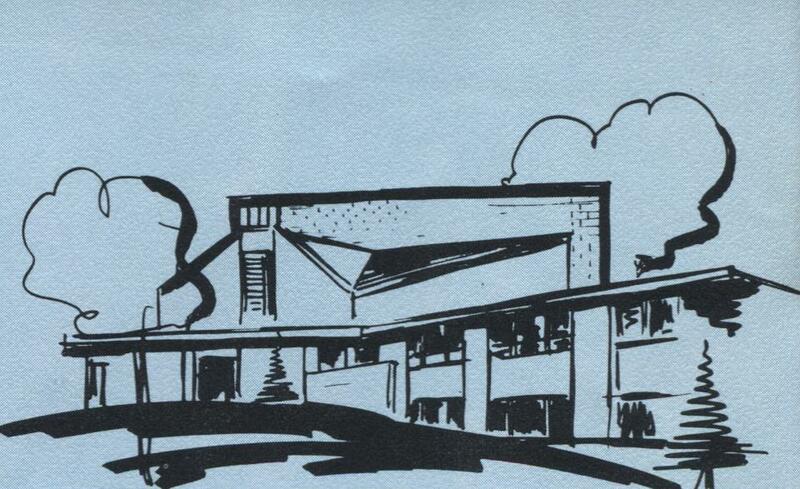 Hoffman Estates offered a $1 million low-interest loan through village-sponsored bonds to Nederlander Organization of Detroit who was developing the Poplar Creek Music Theater which was being developed at an overall cost of $15 million. 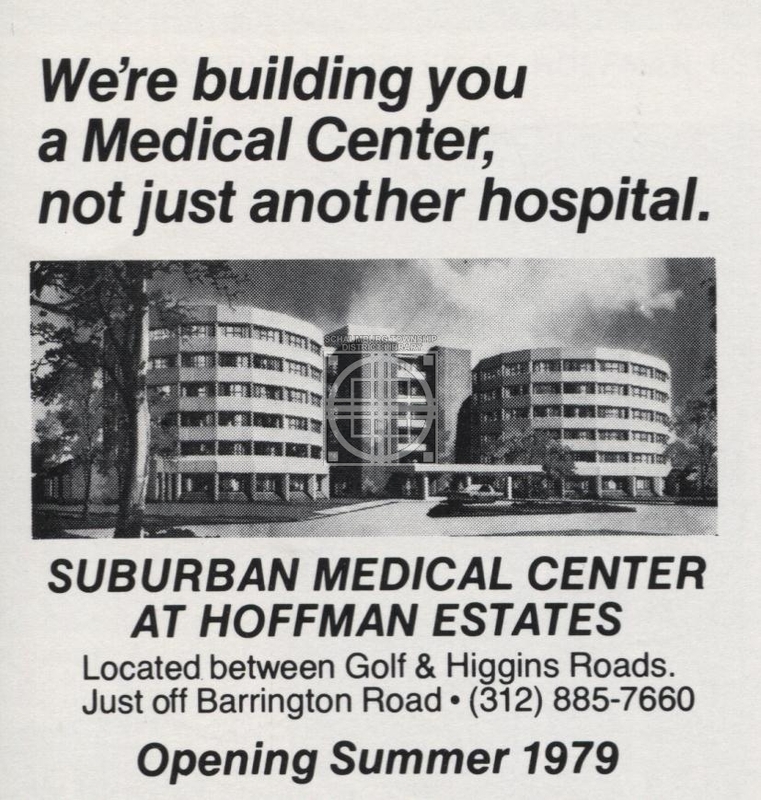 After five years of planning, the Suburban Medical Center of Hoffman Estates was close to being built. The exterior walls were up and the interior was close to finished. Chuck Iobe, the administrator, was happy with the numerous windows, the circular nurses’ stations and the cheerful, orange, red and blue walls. The Dominicks at 2575 W. Golf Road was all set for Valentine’s Day and was offering .79 Suave shampoo, Gallo table wines 3/$7.98, Kodak film for $2.69 and diamond earrings for $7.99. Not to mention cologne, lipstick and candy! Village officials approved the construction of Woodfield Lexus in Hoffman Estates to be built at the corner of Higgins Road and Evanston Street. 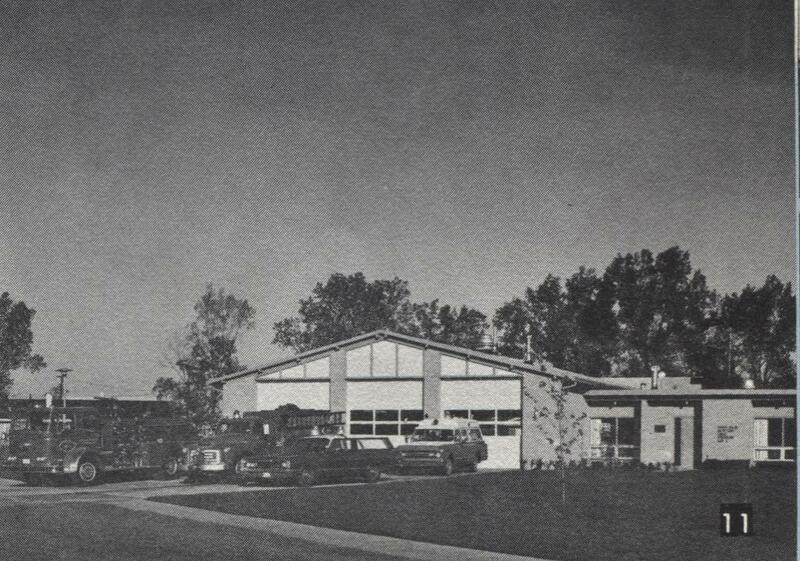 It was built next to Resnick’s Hyundai and was its first location in Schaumburg Township. As part of Hoffman Estate’s 30th anniversary, the Daily Herald accepted questions regarding the history of the village. One of the questions was “When, where and why did Hoffman Estates first annex north of the tollway?” The answer that was provided by the village was: This annexation took place in 1961. There was a land developer who wanted some farm land annexed to the village of Hoffman Estates for the purpose of receiving village services for his development. The Northwest Tollway separated the potential development from the existing village of Hoffman Estates. 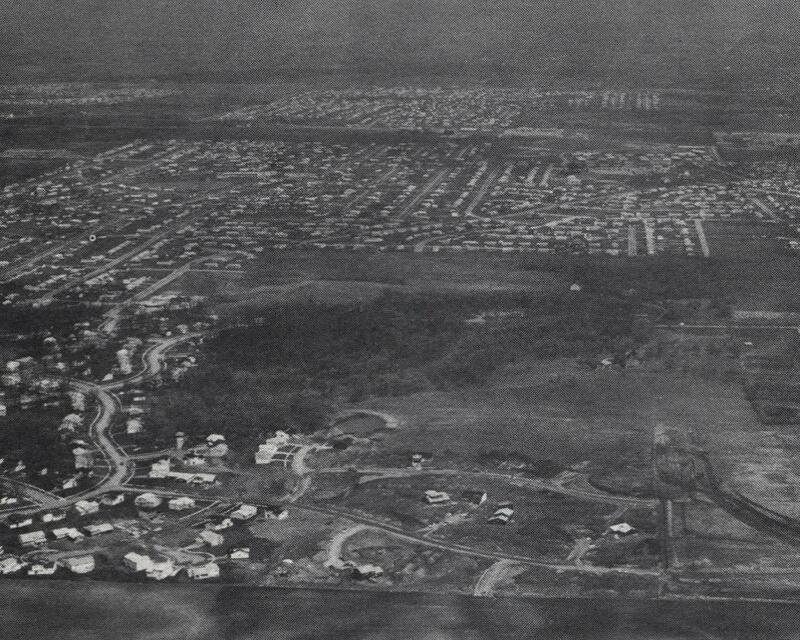 The decision was finally made to annex by way of Barrington Road over the tollway to Central Road and then including the area that is now Winston Knolls. The sale of Hoffman Estates Medical Center became final February 1 and it would be now known as St. Alexius Medical Center. They also closed on Woodland Hospital, a related-mental health facility that was nearby on Moon Lake Boulevard. Hillcrest School was accepting applications for their new concept school that would group different grades together and design customized learning plans for each student. They had already received 294 applications for 300 openings. The Village of Hoffman Estates issued a proclamation to an ailing Walter Payton offering him “their concern, care and ecumenical prayers” as a “Hoffman Estates business entrepreneur, professional football player and gentleman.” Mayor McLeod hailed him as a “great corporate neighbor” who contributed to numerous local programs such as the Children’s Advocacy Center for abused children. 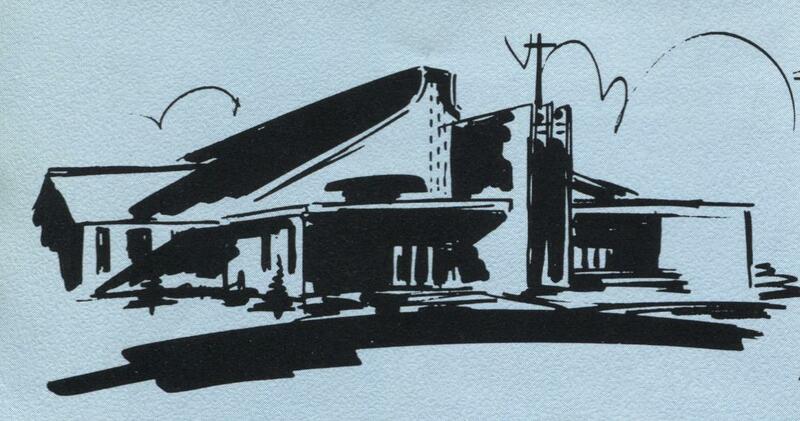 Lakeview School in Hoffman Estates (as seen in the photo above) was celebrating its 50th birthday and was seeking former students, PTA members, community friends, families, teachers and staff who attended or worked at the school to attend the 50th celebration. 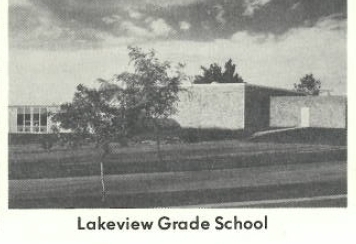 Lakeview School opened in 1959–the same year the village was incorporated. Susan Kenley-Rupnow, who served as member of the Hoffman Estates Village Board from 1985 to 2005 and then went on to serve as a board member for the District 211 board from 2007 until her death on February 14. She followed her father, John Harmon, who served as a village board member in the early 1960s and was instrumental in pushing for the Public Works building in 1986 and 1987. The Tyson American Cup was held at the Sears Centre arena on February 21 and featured David Sender, Jordyn Wieber and Joseph Haggerty in the international gymnastics competition. Olympic greats like Mary Lou Retton, Kerri Strug and Paul Hamm were on hand to sign autographs. For years the small farm on the southeast corner of Higgins and Plum Grove Road seemed to persevere in spite of the growth around it. 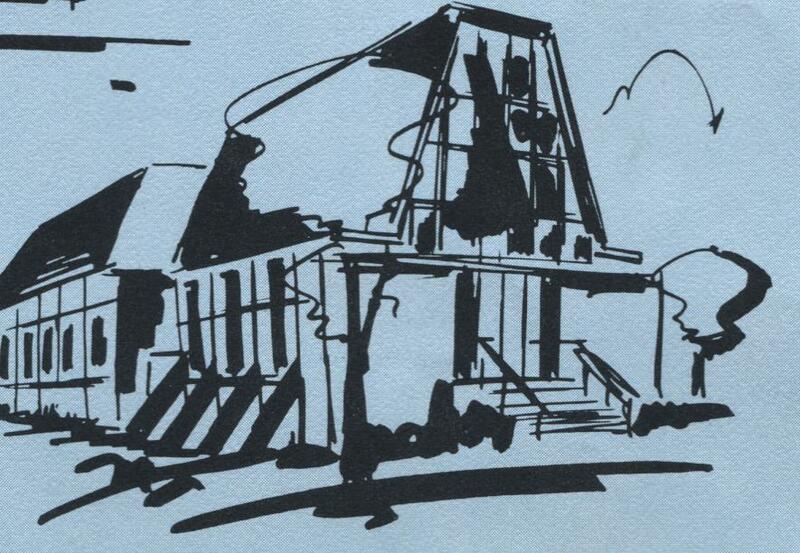 If you lived or worked in Schaumburg Township from 1980 to 2000 during the height of office development, you couldn’t help but notice the fields, the barns and the white farmhouse that stood out on busy Higgins Road. This was the Winkelhake property, purchased in 1848 by Christof Winkelhake, two years before the township itself was established in 1850. Through sheer dint of will and passion, the Winkelhakes managed to maintain their agricultural independence for 150 years, despite all of the development that surrounded their farm. Christof Winkelhake and his wife, Louise Marie, emigrated here from Germany around 1845, eventually purchasing 80 acres from the government as a land patent in 1848. The property was obtained in two different parcels a little over a week apart on March 1 and 10, according to the Bureau of Land Management’s General Land Office Records. The 1861 map above shows the Winkelhake property, 160 acres at the time, stretched laterally across Higgins Road. Note that Plum Grove Road came down from the north, through Horace “H.P.” Williams’ property, and ended at Higgins Road. It would be years before this gravel road extended south through the heart of the Winkelhake property. 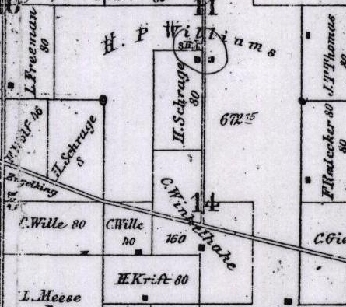 All of the plat maps from 1861 to 1947 depict Plum Grove as a straight line, moving north/south through the Township. 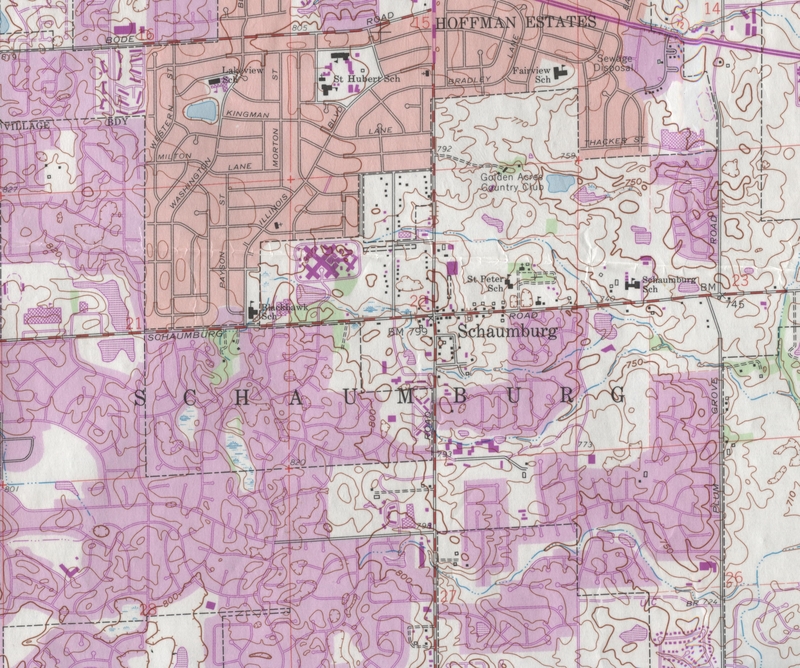 It isn’t until the 1947 map that we see Plum Grove take the slight jog that remains there today. It is my presumption that when it was finally paved it was necessary to go around, rather than through, the farmplace of the Winkelhake farm–hence the curve. After establishing the farm for future generations, Christof died in 1897 at the age of 82. Both he and his wife, who had died ten years before him, are buried at St. Peter’s Lutheran Church Cemetery. 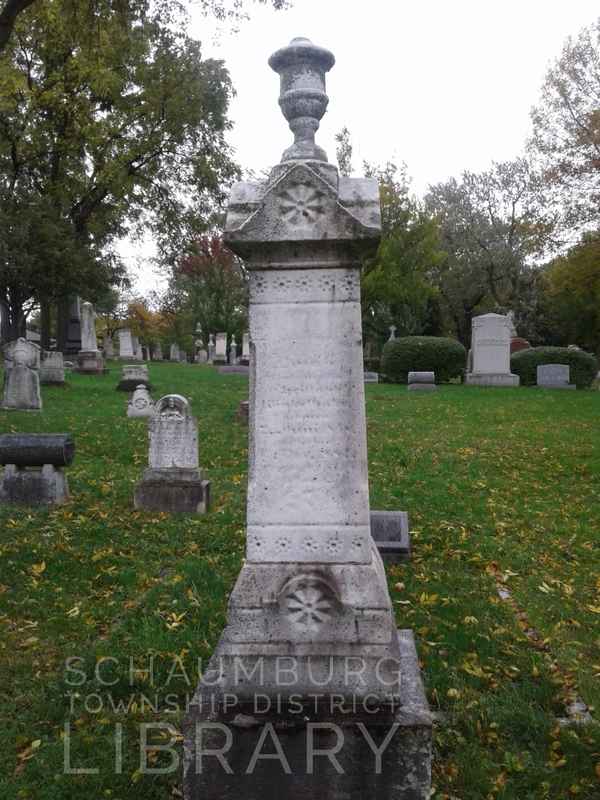 Below is their grave marker with its unique, ornamental finial on top. The farm passed on to his son, Henry Winkelhake who was born in 1847 and was one of the first to be baptized within the St. Peter Lutheran Church congregation that formed in the same year. When he died in 1907, his two sons, Henry Jr. and Herman, farmed two different parcels, as can be seen on the 1926 plat map below. (Note Plum Grove’s straight, due south direction.) 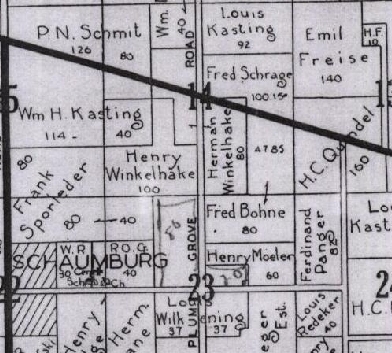 According to this map, Herman was farming the original property and Henry was farming the property that had been acquired on the east side of Plum Grove. After their deaths, Herman’s sons, Louis and Herman, took over the farming, continuing to milk cows and grow corn, grain and soybeans. They sold off parcels here and there, particularly the portion that had been farmed by Henry on the west side of Plum Grove Road. That was sold to Arthur and Dorothy Hammerstein as their second farm. 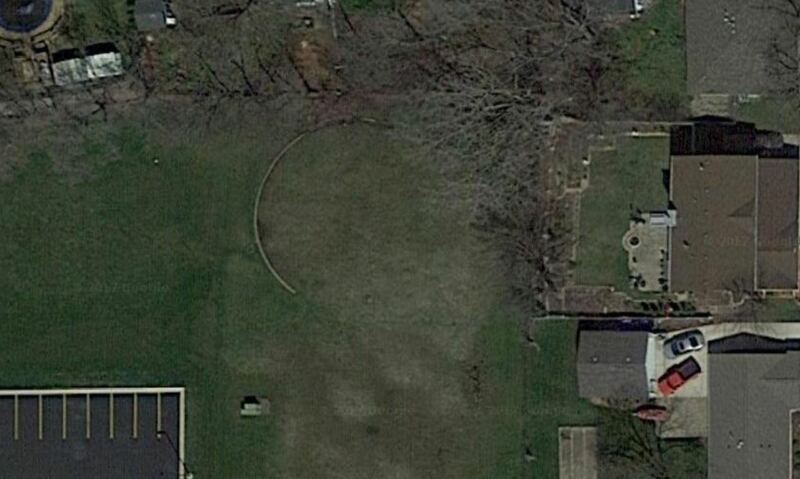 When Arthur Hammerstein died in 1955, his wife sold their two farms on Roselle Road and Plum Grove Road. 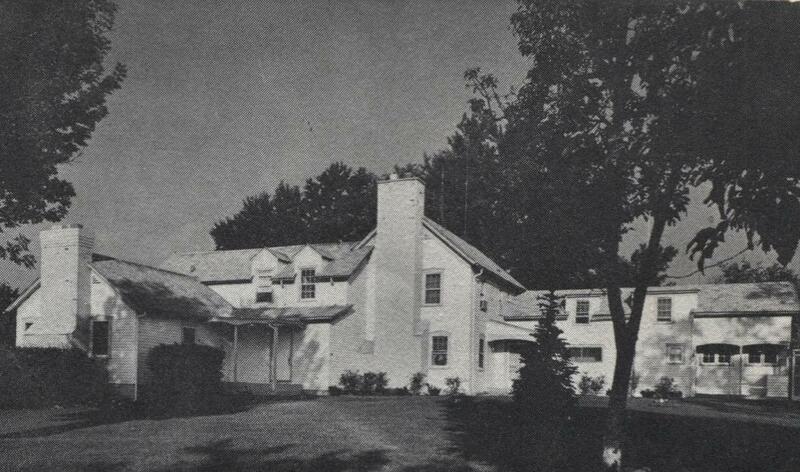 Eventually Palatine Township High School District acquired a portion of the Plum Grove Road farm that they would later use as the grounds for Conant High School, the first high school in the township. 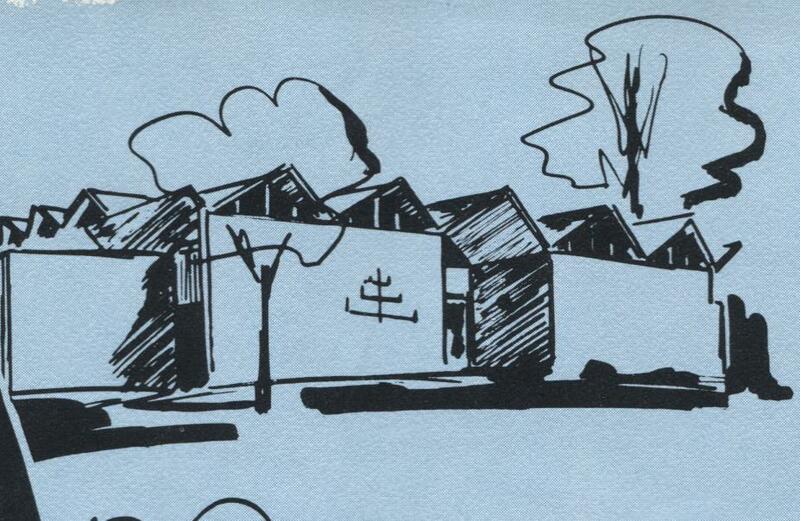 Before that was built the school district rented the 38 acres back to the Winkelhakes to farm in 1959. It is quite interesting that the school district was calling it the Hammerstein school site. After working the farm for many years, Louis left and moved to Milwaukee. Herman continued to live in the white farmhouse, persevering season after season until his son Ron came back to help around 1987. Herman was bound and determined not to sell the property and, in fact, never did. He lived there until the day he died in 1995. 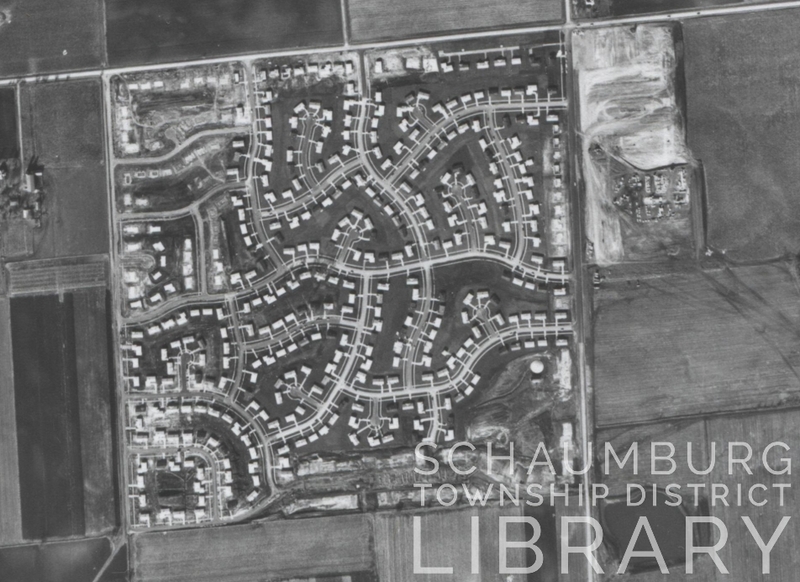 In the photo below, you can see how embedded the Winkelhakes were in Schaumburg Township and St. Peter Lutheran Church. Most of this row consists of the Winkelhakes we’ve been talking about, except for Herman, who was the last to farm. He is buried at St. Peter’s but is not part of this family plot. By 1997, it was apparent to Herman’s survivors that it was time to sell the beloved farm that had been in the family for 150 years. 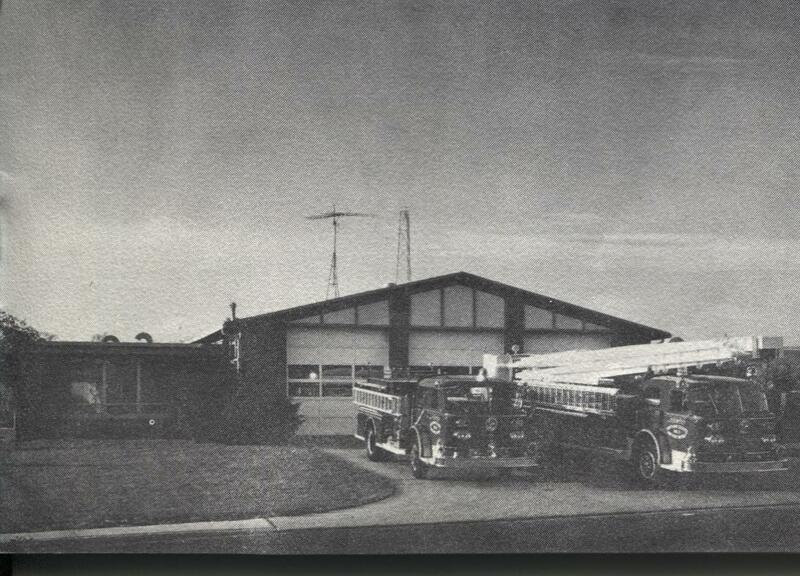 Over the course of a few years, the family farm became the Morningside subdivision (which is on the homeplace), Bank of America and Sunrise of Schaumburg, an assisted living facility, to name a few. Do you suppose some of these tall trees that line Plum Grove Road and border Higgins, are leftovers from the oldest family farm in Schaumburg Township? If they are, it’s sure nice to know there are remnants of the farm that still survive. This photo of Vincent Price and Carol Lawrence at the 1971 grand opening of Woodfield is part of the library’s archive. From the beginning, my question was, “Why Vincent Price?” It wasn’t until I mentioned it to another librarian and he began digging on his own, that we found the answer. Vincent Price was an actor whose deep, distinctive voice lent itself to the multiple horror films for which he was predominantly known. 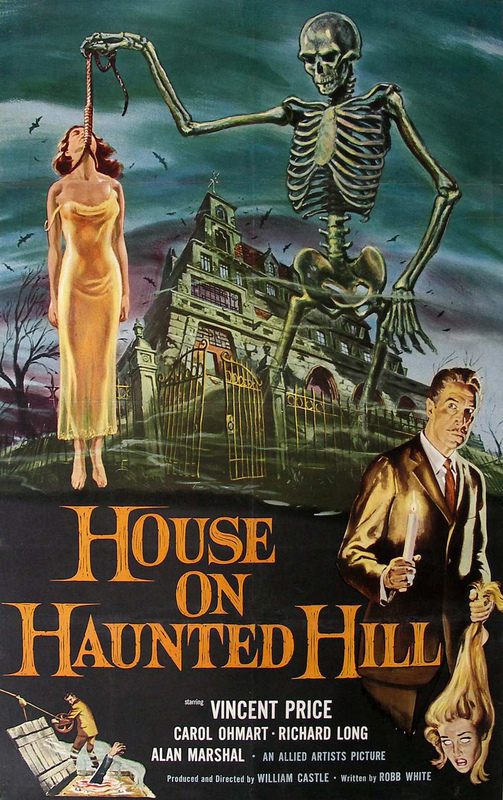 His more famous movies include The House On Haunted Hill, The House of Usher and Tales of Terror. 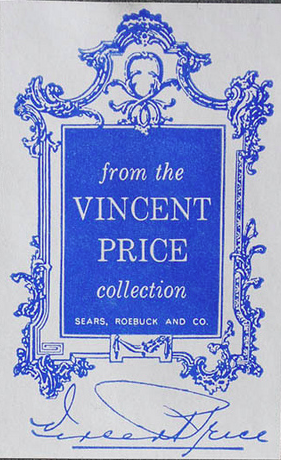 Over the years Mr. Price not only purchased many pieces of fine art for Sears, he also purchased entire collections and “even commissioned artists, including Salvador Dali, to do works specifically for the program.” In addition, the Sears Vincent Price Gallery of Fine Art opened in Chicago in 1966. When Woodfield opened on September 9, 1971, it was named for General “Wood”, chairman of the board of directors at Sears, and Marshall “Field” of the similarly named Chicago department store. It stands to reason that Sears, one of the first two main anchors of the mall, would have had significant input in the opening day festivities. As a result, they brought in Vincent Price to be master of ceremonies for the day. It didn’t stop there though. Sears took advantage of his presence in the area and used him to develop a series of home decorating courses that were also held in the Woodfield store. Additionally, they tapped into his other great love which was cooking. Consequently, on September 9, he gave informative talks hourly from 9:30 to 2:30 on the subjects of art, gourmet cooking and home decorating. Vincent Price was truly a Renaissance man and certainly enhanced the Woodfield opening day celebrations. It would be interesting to know if there was a similar backstory for the presence of Carol Lawrence! A column from the September 10, 1971 Herald and an ad from the September 8, 1971 Herald assisted me in writing this blog posting. The photo of the imprint stamp originates from the superradnow.com blog. We thank them for the use. Because the 8th graders of St. Peter East School District had to attend public school to be granted their 8th grade diploma, the [local Lutheran] children went to Schaumburg Township School 53 to complete the requirements for their 8th grade diploma. The students needed to prove their proficiency in the basic skills of reading, math, English and whatever the local public school teacher deemed necessary. The Lutheran schools were not accredited by the Cook County Superintendent of Schools and were not allowed to grant 8th grade diplomas. 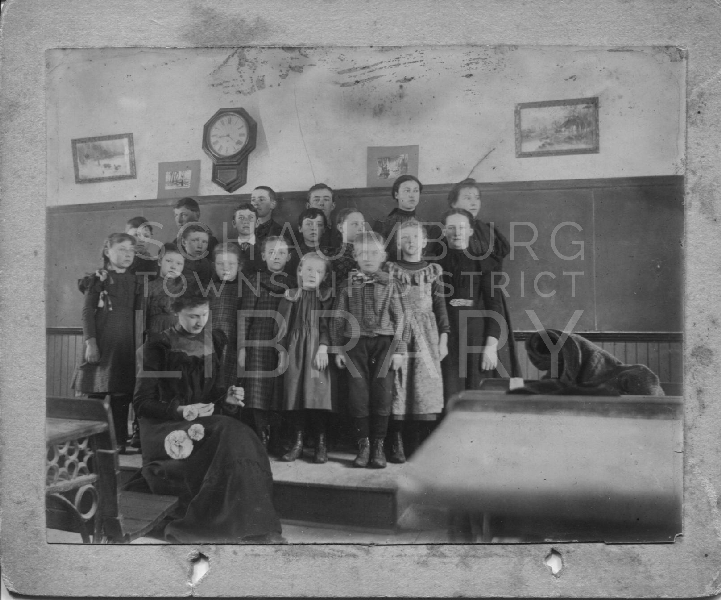 The District 53 school was of simple, white clapboard construction. The school faced the road and it had three windows on the north side and three windows on the south side. There was a window on either side of the door for the coat room which gave light to this area. All of the windows had shutters that could be opened and closed. The chimney for the wood/coal burning stove was on the east wall of the school. There was a small stoop at the door, which by the 1900s, was made of concrete. The school did not have a bell tower. 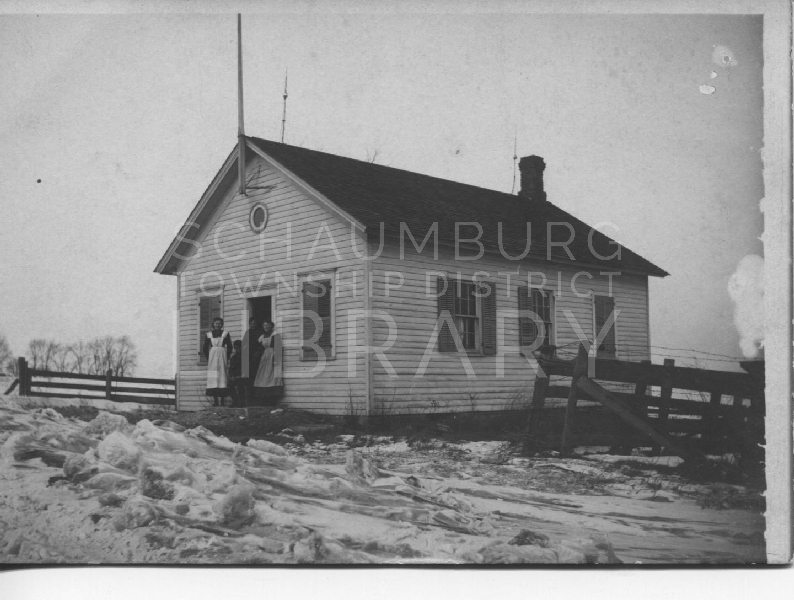 In the Cook County Biennial Report of the County Superintendent of School from July 1, 1894 to June 30, 1896, it was reported that two of the five one-room schools in Schaumburg Township were new. Was the District 53 School one of the two? Since the school building was set on a hill with fields surrounding it, lightning rods were installed on the roof. Was this installation for lightning protection done by the District 53 directors? 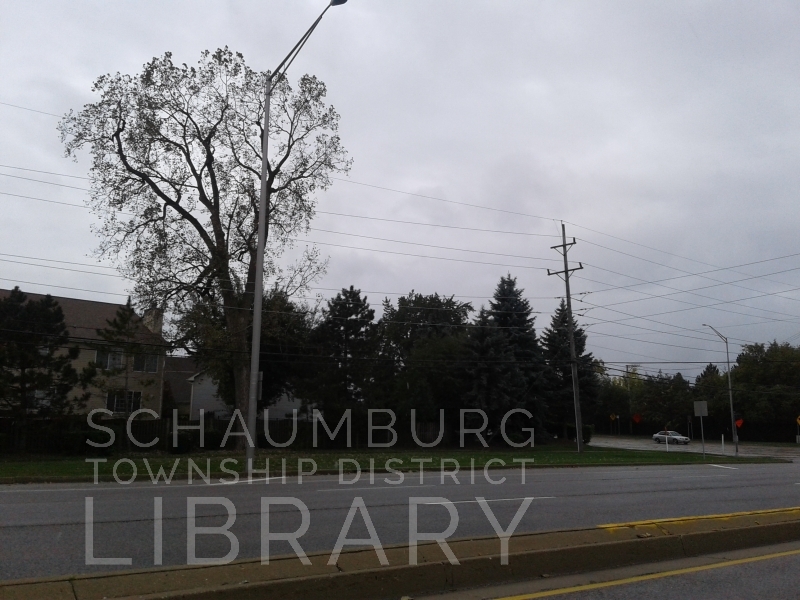 The picture shows two lightning rods, but pictures of the four other Schaumburg Township schools do not show rods. …it is hard to say if the school had these rods from the time it was built or if they were installed when the area farmers placed the rods on their barns. 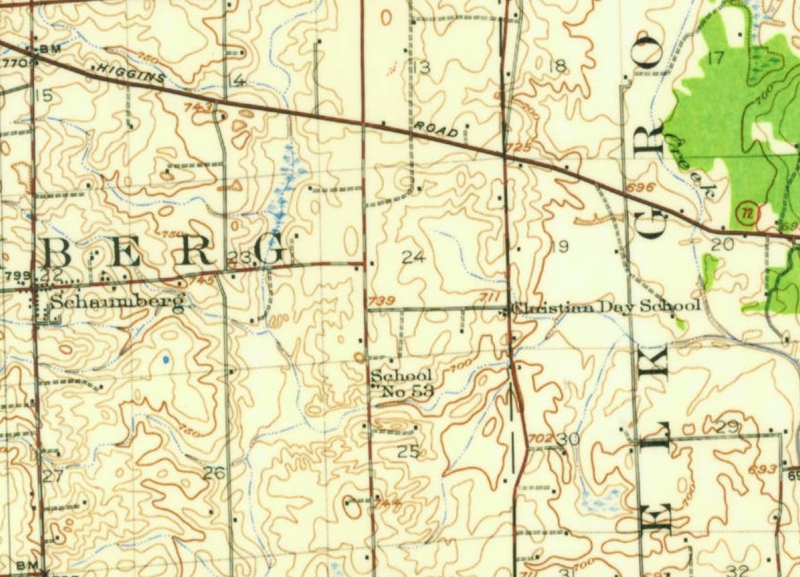 While talking about attending the District 53 School from 1904 to 1912, Carrie Gathman Ohlmann recalled walking from the family farm at the northwest corner of Rohlwing and Nerge Roads. Born April 7, 1898, Carrie was the eighth of the nine Gathman children to attend this school. 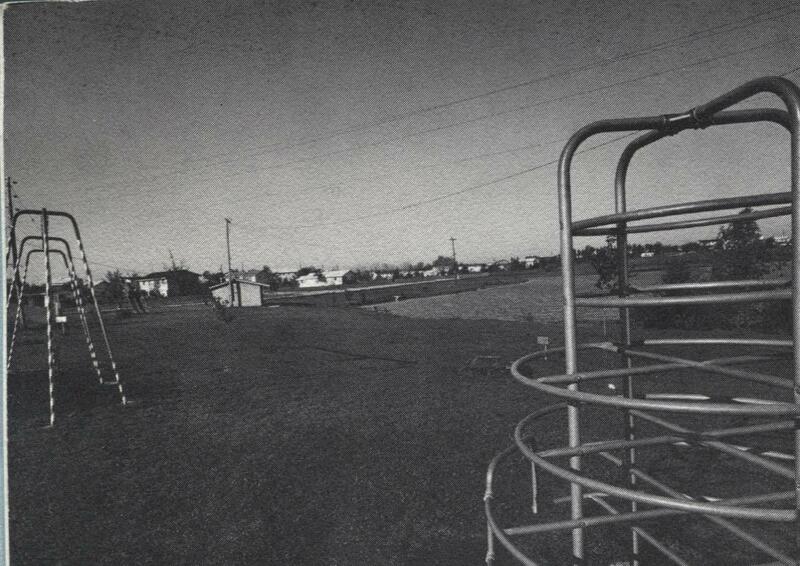 The children walked through the fields following the fence lines and hedges. It was a two-mile walk if they went through the fields, but it was three miles when they followed the roads–Rohlwing south to Nerge, Nerge west to Meacham, Meacham north to the school. When the weather was especially bad, the children were taken to school by horse and wagon–the milk wagon. In the spring the Gathman children liked to walk home through the fields. When they came to the creek, they crossed it by jumping from stone to stone. Many times they got wet or fell into the water. Some farmers had stiles over the pasture fences, but the children always knew where the bulls were kept. They avoided crossing through a pasture where a bull was grazing as they knew that was flirting with danger. Carrie Ohlmann remembered two of the teachers she had in her eight years at the school. The teachers were Miss Amelia Blix and Miss Budlong. She stated that the teachers boarded at the Pfingsten farm on Meacham Road. Water for the school was carried in a pail from the nearby Fasse farm well or from the creek which was south of the school. She also mentioned getting water from a nearby spring. Since she didn’t elaborate on the spring, the exact location is unknown. There were several springs on the farms in that area. The pail of water from the well was for drinking but part of it was poured into a basin, which was used for washing hands. This water in the washbasin was kept until the end of the school day. At that time it was thrown out. The outhouse for the school was located to the east of the school. There was a side for the boys and a side for the girls. One of the chores assigned to the children was to wash down the interior of the outhouses with water and a broom. The water for this chore came from the spring or the creek. Carrie stated that all of the classes at the District 53 school were taught in English. The school had a pump organ that was instrumental in Carrie’s love of music. The teachers gave lessons to students after school and Carrie was one of those who participated. This teacher, at the turn of the century, gave Carrie a gift that lasted her entire life. The interior of the District 53 school was simple. …The plain wooden pine floor was swept clean. There was wainscoting on the walls below the windows. 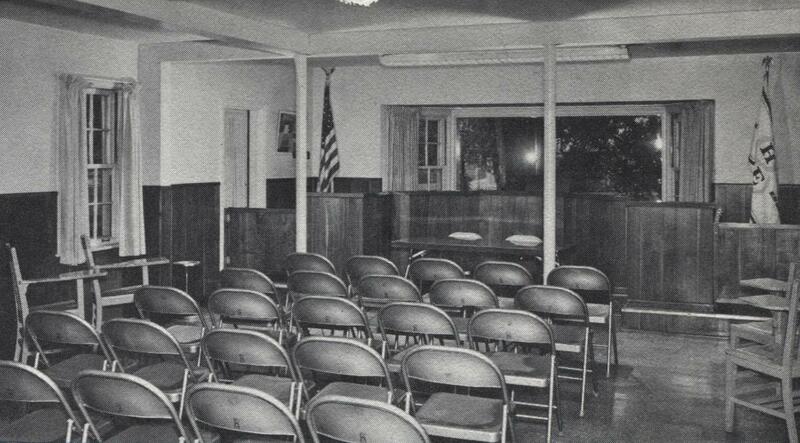 The desks were mounted on wooden strips so that the strips could be moved to one side for cleaning and activities. There was a raised platform at the front of the classroom which became a stage for plays, poetry recitations and musical programs for parents and neighborhood families. This platform was about six inches higher than the floor. The ceiling was covered with textured tin. …Because the majority of the farmers in the District 53 school attendance area were Lutheran, the greater number of the children attended St. Peter East District School after it was built. 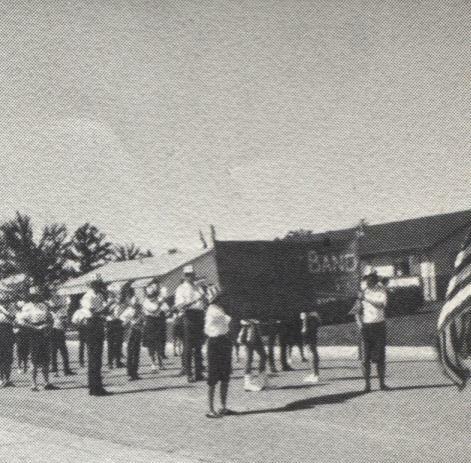 The population of the District 53 school declined to the extent that the school was closed in 1925, and the children began attending District 54 School in Schaumburg Center. When the school was closed, William Thies bought the schoolhouse at auction for $117. 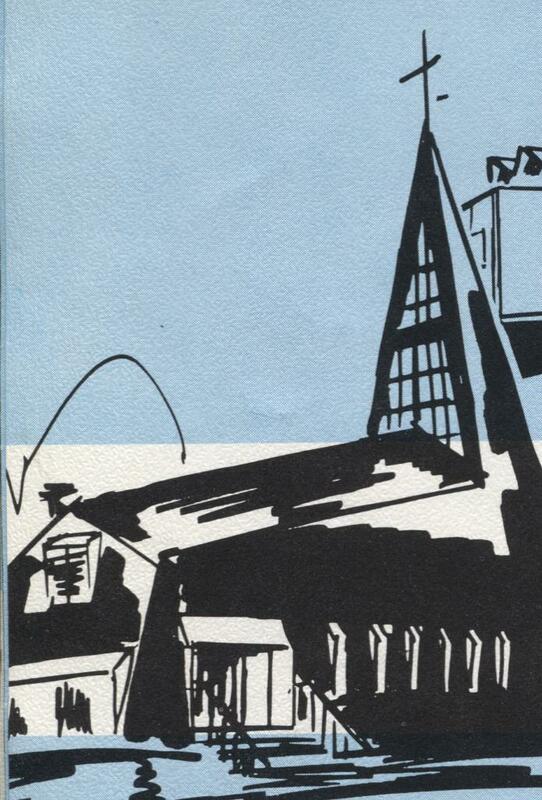 The Thies brothers moved the school from the Fasse farm site to their farm south on Meacham Road… The school desks were put in the attic, the windows were replaced with a transparent film that would let in the beneficial rays of the sun, nests were added, and a roosting area was built. The school was painted red to match the other farm buildings and it officially became the main chicken house for the Thies family until they sold the farm and moved in 1960. 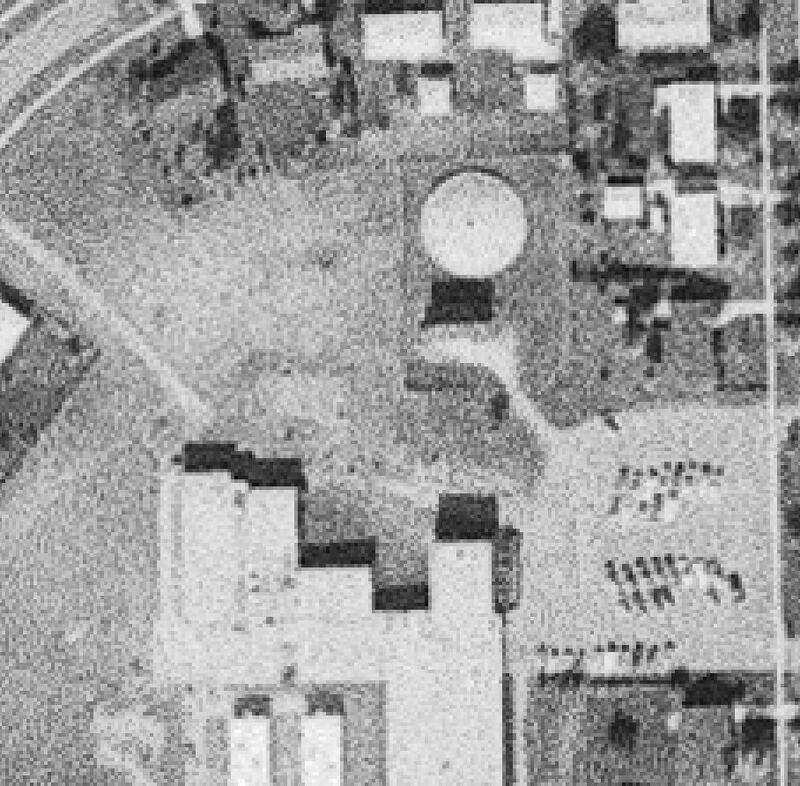 The school remained on the farm until later in the 1960s when it was demolished by Centex to make way for Elk Grove houses. 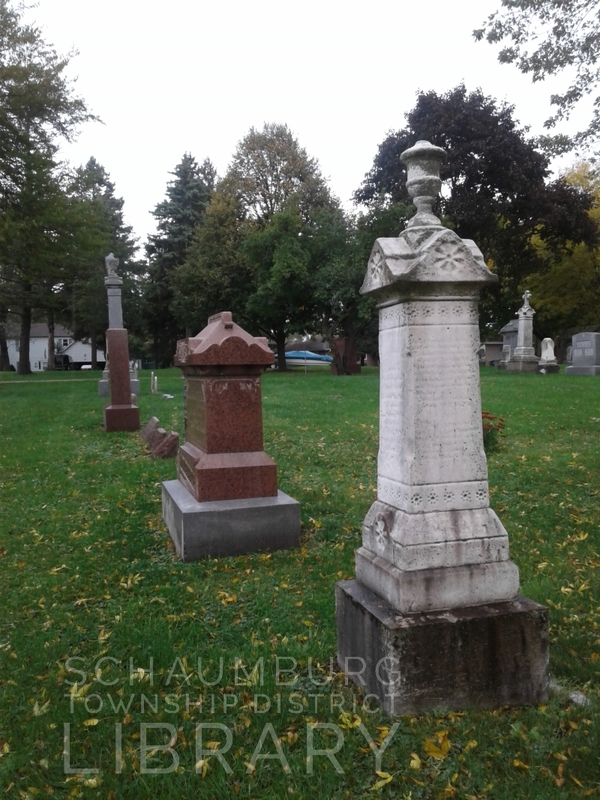 The text for this blog posting is an excerpt from Schaumburg of My Ancestors by LaVonne Thies Presley, published in 2012. 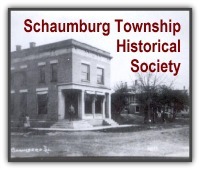 The book is an in-depth look at Schaumburg Township around the turn of the nineteenth century. If you’re driving on Plum Grove Road, just south of Schaumburg Road, you can see this sign on the west side of the road, just before a small creek crosses beneath the road. 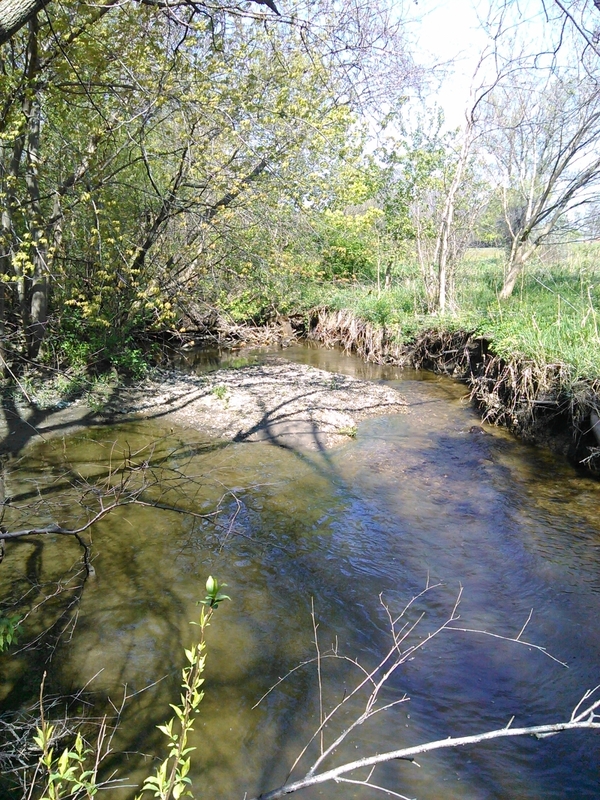 Yeargin Creek is a branch of the Salt Creek that feeds into the Des Plaines River. It is formed by the confluence of three small streams that originate on the west side of Roselle Road. You can see the streams more clearly on this 1961 Palatine Quadrangle topographical map before development obscured the origins. The first, most northerly stream has its head waters on the Friendship Village property, crossing Pleasant Drive behind the old library that is now the Bethel Baptist Church Preschool. 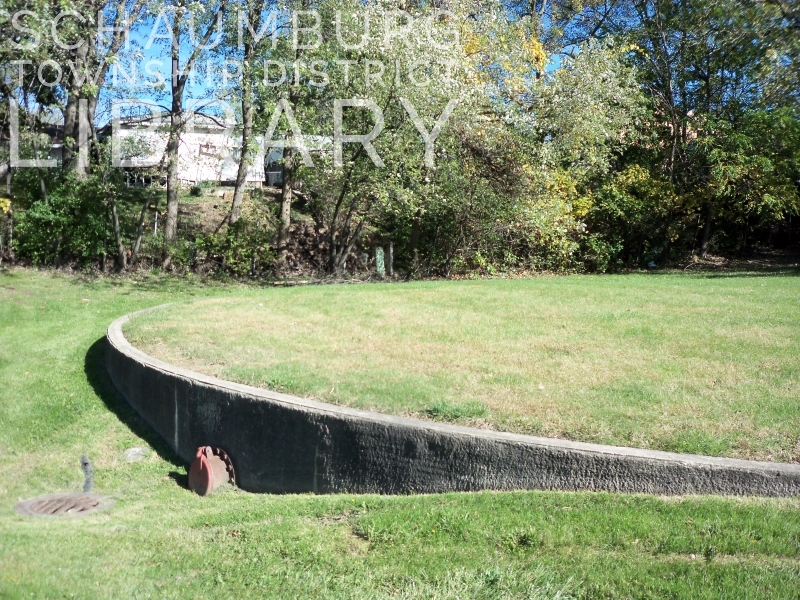 It then crosses Roselle Road, running through the Schaumburg Golf Club property, skirting the back of the St. Peter Lutheran Church property and curving its way towards Schaumburg Road where it crosses into the pond at the Municipal Center. 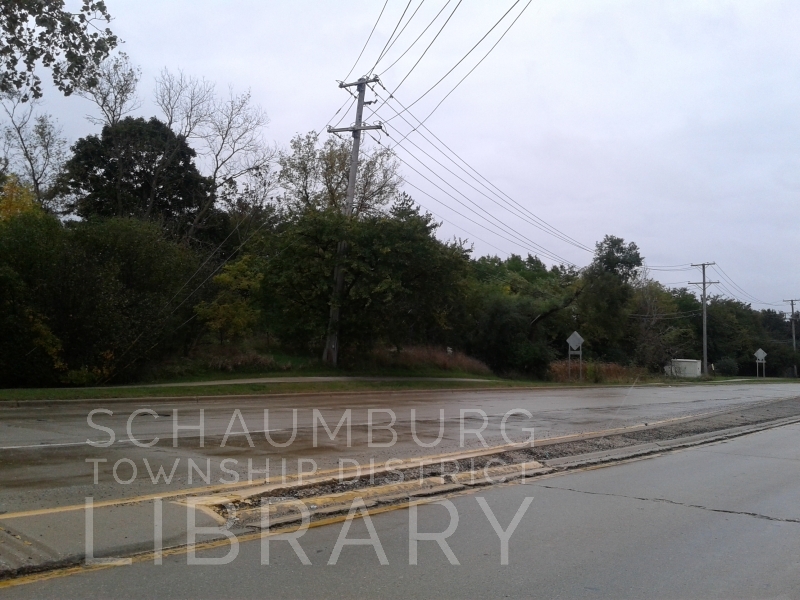 The other two streams begin south of Schaumburg Road, with the first one starting in the southern part of Town Square and crossing Roselle Road near the shopping center’s traffic light. The other starts south of the Town Square Condominiums and crosses Roselle Road at that point. The middle branch eventually flows into the pond on the Municipal Center grounds. The third, most southerly branch, enters the property south of the Municipal Center parking lot. Granted, the three tributaries are largely buried underground for most of their length but all of the forks converge in the wooded area east of the Prairie Center For The Arts and become Yeargin Creek, an above ground, flowing stream. 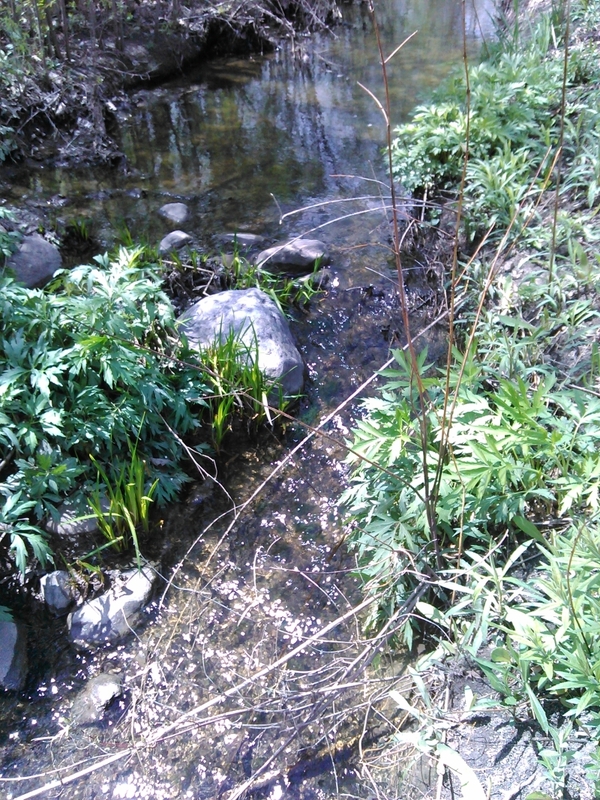 The creek runs to Plum Grove Road where it then crosses into the Spring Valley property. Plum Grove Road is where Yeargin Creek officially ends. 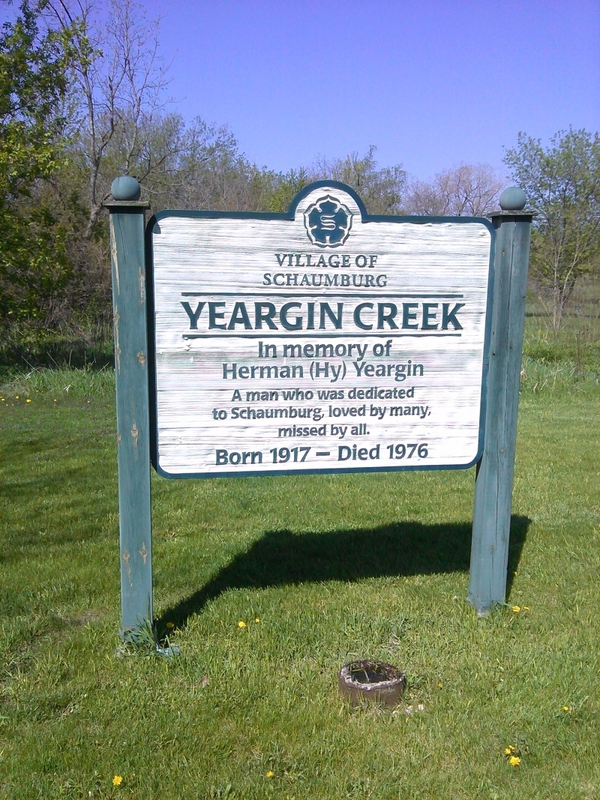 As the sign says above, the creek was named for Herman “Hy” Yeargin who served with the Schaumburg Civil Defense unit, as a Schaumburg reserve patrolman overseeing the Bicycle Court program and as license inspector for the village. He passed away in 1976 and the creek was named for him soon after at the suggestion of Mayor Al Larson who was a village trustee at the time. According to the mayor, Mr. Yeargin was a dedicated public servant who took his duties very seriously–all with a good sense of humor. 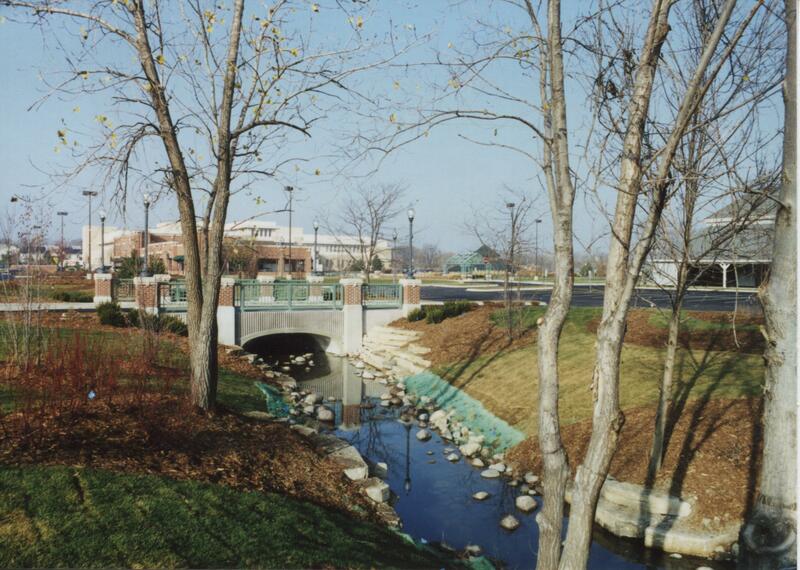 In 2004 the Village of Schaumburg won the Conservation and Native Landscaping Award issued by the U.S. Environmental Protection Agency and Chicago Wilderness for their restoration of Yeargin Creek. The project replaced storm culverts with bridges, stabilized and regraded stream banks and preserved native plants to promote aeration and slower water flow. This is one of the bridges crossing the southern tributary that runs along the edge of the Municipal Center parking lot. 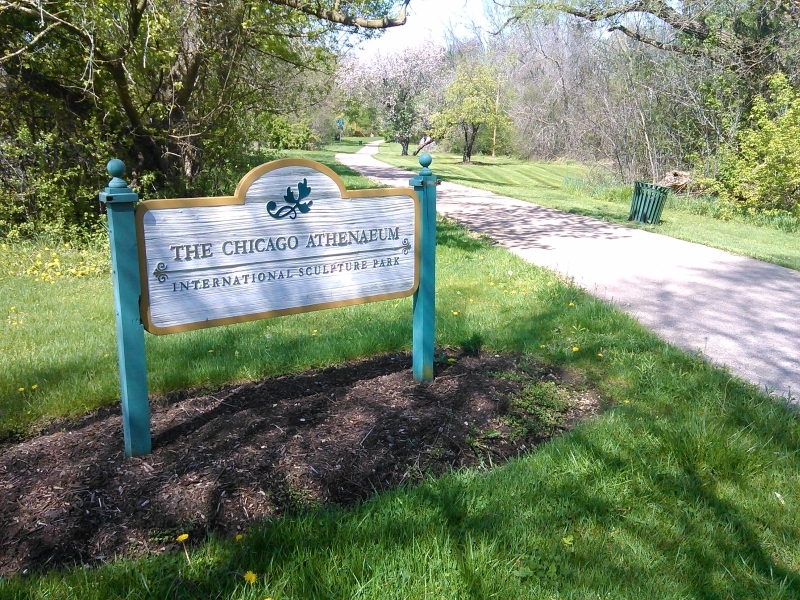 Today a walking/biking trail runs alongside Yeargin Creek and is highlighted by international sculptures from The Chicago Athenaeum. Hy Yeargin has been gone for 40 years but we honor him still with this beautiful bit of nature in the middle of our township.